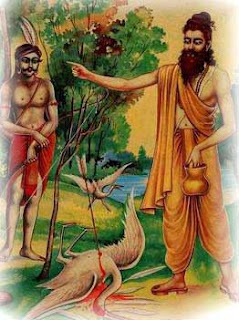 Sage Valmiki had heard the story of Lord Ram from Sage Narada but was unable to start writing it as he was not able to find an apt meter to compose the poem. Once Sage Valmiki was on his way to Ganga Snaana and came across a beautiful stream named “tamasa.” Captivated by the stream, Sage Valmiki decided to have his bath in the stream and then meditate on its banks. When he was looking for a suitable place to step into the stream, he heard the sweet chirping of two birds in love – a pair of krowncha birds. He was pleased to see the happy couple and stood their and watched them. Suddenly the male bird fell from the sky after being hit by an arrow. The silent and beautiful area was soon filled with the female bird’s cry of agony. This is the first shloka of Ramayana. It is regarded as the first shloka among all the Poems. He is regarded as the first Kavi or poet, i.e., “Aadi Kavi”. Ramayana is also titled as the first Kavya. Later Lord Brahma appeared before him and told him to write Ramayana with whatever information he has received from Narada Maharshi. He also blessed him with the power to see whatever happened in the past and also blessed that whatever he writes will be true.